The events of recent weeks demonstrate high business activity in the field of logistics. 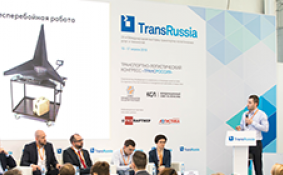 This is confirmed by the emergence of new non-standard events, such as the first Congress of Managers and Specialists in Logistics and Supply Chains of Manufacturers and Retailers, participants and partners of the Council of Supply Chain Professionals, as well as the first Russian Forum – "Logistics Leaders 2018" where the leaders of international and Russian companies gathered. We have noticed that innovative technologies occupy not the last place in the list of topics discussed by the logistics community. Following the general trend, we have dedicated a new issue to innovations in logistics, the interest to which, in our opinion, will only grow from year to year. We bring to your attention the article by Arthur Muradyan about unmanned transport. In the article he informs about two aspects of innovative transport and software, which require much higher attention. Sergei Yakubanets, in the article, devoted to a block-chain, talks about the prospects that this technology opens up for logistics. Vladimir Prokhorov and Anton Gayev analyze the methods, used by the network companies to improve the efficiency of logistics operations in the sphere of everyday goods trade, and also identify the trends that can be taken into account to improve the efficiency of FMCG retailers. In this new issue, we continue to publish a series of materials by Vitaly Solodovnikov, devoted to the creation of an industrial and practical methodology for integrated supply chain planning for industrial enterprises. The article is interesting as it presents the results of the development of the promises management process in supply chains. A practical example of implementation of the proposed process at the Trinecke Zelezarny company is considered. Irina Pustohina and Denis Pustokhin consider the topic of city logistics. The authors speak about the chronology of the development of carsharing in Russia, advantages and disadvantages, about the companies-operators to provide the service of carsharing in Moscow. The issue about the interaction between the client and the executor in the field of cargo transportation is covered in the publication by Pavel Maslennikov, but Lyudmila Teselkina and Oksana Kurochkina touch on the theme devoted to the procedure of "Processing in the customs territory". The authors talk about the realities, pitfalls and prospects of licensing customs procedure, Russian companies being the case. We’ll be happy to meet you on the pages of the “LOGISTICS” journal!